Group to Catapult Your Grades Sky High! Yes, Marc! 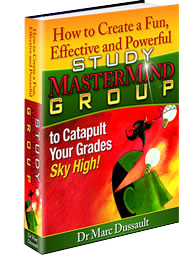 Please send me the download link for How to Create a Fun, Effective and Powerful Study MasterMind Group to Catapult Your Grades Sky High! I understand that I'll immediately be sent the download link to the book and all the bonuses, so I can start building my MasterMind Group and getting ahead with my studies MUCH quicker and easier than now. I also understand that I can order with confidence because I am protected by your 60-day Money Back Guarantee. If I am not completely satisfied with my purchase, I can simply let you know for a prompt and courteous refund. I can't lose! Yes, Marc! Give me access to the both How to Create a Fun, Effective and Powerful Study MasterMind Group AND Get The Best Grades With The Least Amount Of Effort for just $49.95, so I can boost my understanding and results while studying LESS. I understand that I will not only receive BOTH of these popular products, but ALL the bonuses as well.